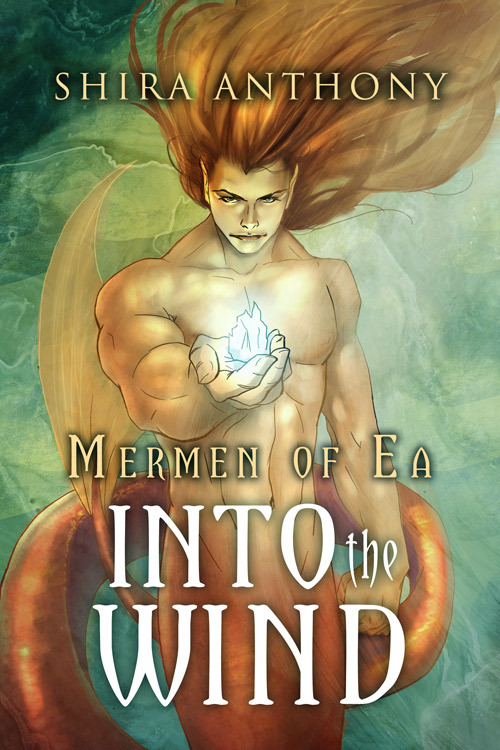 This is the final installment in the Mermen of Ea Series from Dreamspinner Press. 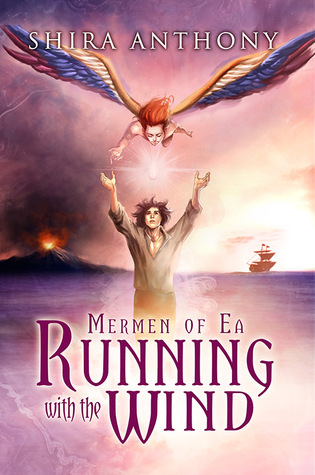 With Running with the Wind, Shira Anthony brings her Mermen of Ea Trilogy to a close and what a ride it has been! From the moment I met the endearing Taren, I was hooked on this imaginative saga of discovery, loss and love. From a simple seaside tavern where we find the young slave,Taren, who is ignorant of his true nature as a merman, through the pirate ships, tumultuous relationships and discovery of a divided Mermen culture, Anthony has built a deeply layered and magical universe to go along with her complicated fantasy characters. That a series of relationships is built upon the plight of a divided people and the renewal of a culture who had lost its way just gives this trilogy added depth and heartfelt angst. The author’s world building is equal to the creativity shown with the characters, all of whom she made it easy to fall in love with. And cry over. Writing the final story, whether to a series or trilogy, is always tricky. Readers have built up certain expectations in their mind that they bring to any final installment and meeting those high expectations is almost always impossible. How does Running with the Wind measure up to mine? Pretty darn well. We have multiple couples and their relationships to bring some closure to, in one case its two couples in one. That would be Taren Laxley who is also the reincarnation of the Ea priest Treande and his lover Ian Dunaidh, captain of the Ea ship the Phantom, who is also the reincarnated Owyn, Ea priest and lover of Treande. We get both the past and the present with these two. And then there is Odhrán and Bastian, who natures I won’t reveal here but these are two powerful characters, so much so that I almost think they “stole” the story away from Taren and Ian. I loved the slow development and revelations that occur with these two. They surprised me, confounded me and I thought their part of this tale was among the most powerful of elements. 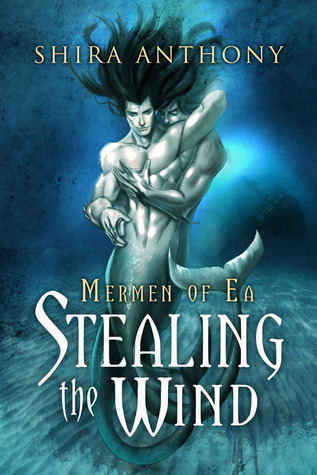 But the Mermen of Ea also includes the unforgettable Jonat Rider, and Vurin, and so many others. 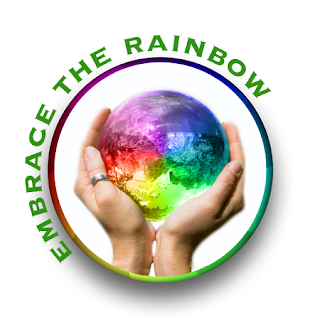 Anthony’s creations are so well developed that you come to care for them all deeply throughout the course of the series and their various fates pull at your hearts at the end of the story. As stated, the final story, especially one with as many plots as found here, has much to tie up and the narrative got a tad crowded along the way. The colony had to be brought back to its true destiny, a huge evil had to be overcome, and some of our major characters had transformations to go through in order to survive and win out at the end. I did find that some passages dragged on a little too long for me but the battles at sea and on land were vividly described, painfully believable and suspenseful. The air and sea felt charged with energy and the drama was everything I could have hoped for and expected of this writer. And yes, I cried some too. A truism that most writers recognize and address in their stories or fables is that a price is almost always extracted from each hero/major character who uses a ancient or forbidden power. Somewhere towards the end of a tale, the hero will have to pay a profound personal cost that is the consequence for the use of magic. That happens here in Running with the Wind but not to the extent that I think the readers were lead to believe would happen by the events leading up to the last battles. Some will be happy about that and others will be let down that the price Taren pays is more of a tap to the wrist then a major sacrifice. How a reader feels about the element will dictate how they feel about the end of this story and series. I have to admit to feeling a bit disappointed, but only a little. That is my only real gripe here. This is a wonderful universe in which to spend hours of time. And Shira Anthony has left enough room and questions that should she ever wish t0 return to it, perhaps to see how Odhrán and Bastian and the others are getting along, including a certain King, well, I would be more than happy to journey back along with her. But if that never happens, we still have the wonderful mermen and humans of the Mermen of Ea saga to keep us happy and involved in their lives. Read them all in the order they were written. Enjoy the journey and end up happy as I did as to how it all played out. It was a wonderful ride, I loved every minute and word of it. Cover art by Anne Cain. I have loved all the covers for this trilogy. This one is lovely as is the first one. But that second cover is so indescribably gorgeous and incandescent that this one suffers a little in comparison. Sales Links: Dreamspinner Press – All Romance (ARe) – Amazon Buy It Here on June 8th. charactersIan Dunaidh, Taren Laxley, Odhrán, Bastian, Seria.. 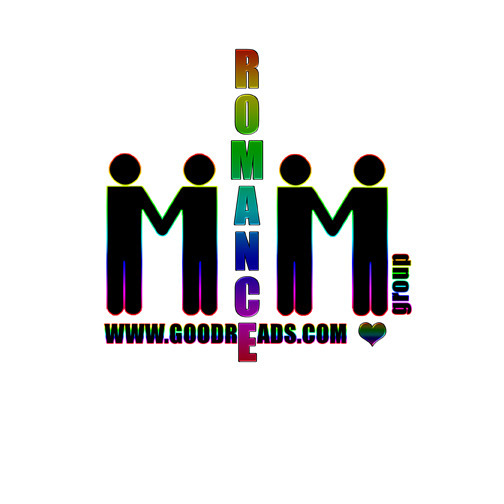 This entry was posted in Book Reviews, Books, Dreamspinner Press, eBooks, Fantasy, LGBTQ Book Reviews, M/M Book Reviews, M/M Fiction, M/M Romance, M/M Supernatural Fiction, Shifters, Weres, Uncategorized and tagged author Shira Anthony, end of the trilogy, gay mermen in love, Mermen of Ea Trilogy by Shira Anthony, Running With the Wind (Mermen of Ea #3) by Shira Anthony, series finale story.